now operational as well as the rest of the locomotive. vans are called Fanny and Johnny, after Fanny and Johnny Craddock). seems to occupy the Passenger Department's every waking moment. A beautiful day on the Ecclesbourne Valley which again saw high passenger numbers, complemented by two parties (one in a minibus and the other in a full coach)! Down the yard, the LMSCA continued work towards making a start on the Brake Third coach and the LMS Brake Van progressed. The 8F group were also in attendance. The DMU Group removed a faulty engine from 51188 (see attached photograph) and test were carried out on the Class 31. 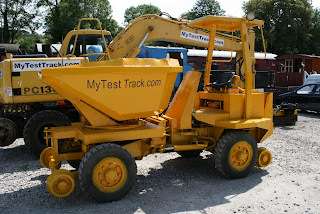 It was good to welcome a new MTT customer this morning who was demonstrating a couple of small trolleys to Network Rail. They found their morning instructive resulting in further development work which may dicate their return to us. Work continued on the second LMS brakevan's floor and patresses were fitting in 51505 as part of the plan to return its lighting to the original. The Booking Hall and Catering made their preparations for the approaching weekend. As the customer finished fairly early Mick and I had an opportunity to review work along the line. Quite a peaceful day after a frenetic week. PS - I am pleased to report that we will shortly receive Class 33 33035 that had been undergoing repairs at Boden Engineering in Birmingham. It is planned that the locomotive will undertake trials after arrival and if all is well will participate in the Home Fleet Gala. The locomotive will have a long term future with us but may participate in other railways galas from time to time. Another day of very solid progress with the day commencing allowing the VCT Landrover to return to Wirksworth before the PWT set off southwards. The PWT achieved another spectacular 240ft of rail transposed that has narrowed the area to be dealt with to a further 240ft sections. With only eight men in the team this has been another remarkable feat. The VCT followed the Works Train after loading their materials and concreted in posts that will allow the Gorsey Bank palisade fence to be extended. After completing this task they made a very good start at clearing vegetation from six bridges that Network Rail wish to inspect and had asked for our help to make them more visible. Today's bridge was our only road overbridge allowing access to the sewerage works and a blazing ash fire was reported after their endeavours. The flail was in action between Shottle and Hazelwood to good effect and ASM Woodhouse dealt with sill repairs to the staff and occasional ladies toilet. The LMSCA continued with the great table project and further progress was made with the BSK. Cathryn's cab roof had been lifted off the locomotive yesterday and much work went on preparing the surfaces for repainting. John Allsop worked his magic on the east side of 51360 and it now sparkles as shown in the accompanying photo. We welcomed a team from East Midlands Trains who were researching a future joint project with us. The Booking Hall continued revenue generation and minds are being concentrated on the immanent launch of our Santa projects. More records broken as we achieved the best weekday results in our entire career. Today's public passenger services were incredibly well supported with significant numbers boarding at Duffield via East Midlands Trains. 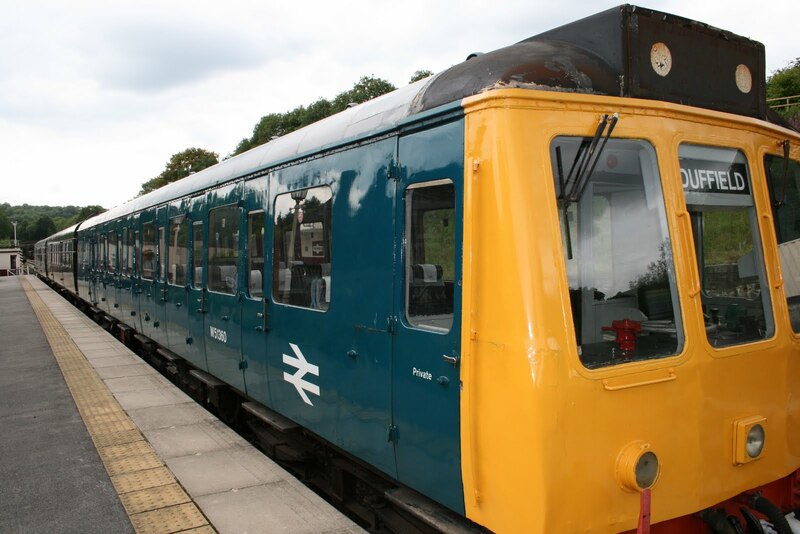 Some 146 passengers travelled on the 1110 Duffield to Wirksworth including a group from the Locomotive & Carriage Institute and a party of retired railwaymen lead by Peter Taylor. Wirksworth station was very busy all day and the experience for our visitors was enhanced by the operation of the narrow gauge and the model railway. 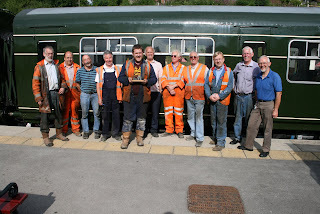 My thanks go to the train crew of Tom, Patrick and Richard who had a long tiring day, Leigh in the Booking Hall, Pat in the EVRA shop, Mike and Matt on the narrow gauge, Garth in his container and Jeff and Izzy in the Buffet Car not forgetting David W and John S collecting a sizable sum at Duffield. I can only desperately hope this is a precursor of the next four Wednesdays. A PWT quietly tightened fishplate bolts between Duffield and milepost 135 3/4 including the replacement of two defective ones and there was quite a shunt at Wirksworth to free up the Class 31 for further tests and move a van that contains a replacement engine for dmu 51505. It would appear that our furthest travelled visitor today had left the Isle of Wight at 0210 and the Institute had travelled from St Pancras. All absolutely wonderful! I attended the funeral of "John the Paint" in Derby this morning and his interest in our Railway was suitably acknowledged. The PWT were out in force today as a result of demands for their expertise and to celebrate Alex Thompson's last day with us. Alex has been a lively presence for most Tuesdays and Thursdays over the last three years during his final years as a student at Callow Park. He now returns to his parental home in Sussex at the significant age of 19 after spending life in residential colleges since aged 6. We all wish him well and will miss his muscle power amongst a more aged community. His departure was marked at lunchtime with a Dorothy chocolate cake and at the end of the day with the presentation of a very nice model of Locomotion. A rare photo of the PWT is attached to mark the occasion. The PWT achieved an exceptional achievement, even judged by their previous endeavours, in that two 240ft sections of side cut rail were transposed between Idridgehay and Shottle. These four tonne sections of rail were moved entirely manually entailing much Radox and stimulants tonight. Richard P decided to attack the vegetation with weed treatment from a hand sprayer and dealt with swathes of the Wirksworth Yard to try and get on top of the task. Alan concentrated on the warning chevrons at either end of the former dust dock making significant progress and the rest of the VCT worked north of Shottle with another two fire day. The flail set off to tackle further areas south of Hazelwood. The DST made further strides with Henry Ellison affixing the one coal bunker, ensuring the sanders are operational, fitting vacuum pipes and assembling the safety valves. The LMSCA continued their long haul with the tables and associated fittings for the Third Open and John Gratton, plumber extraordinaire, tried to resolve the water supply to the taps in the centre car. This was because each time the toilet tank is filled the water leaks away via the taps. Fred and Iris returned to give the Mess Hall a good clean and the filing fairy, Dawn, worked away on our record keeping. The Booking Hall continued their good work on revenue generation and Relate occupied the Buffet Car with an in depth meeting. There were no microphones so I can't report on the content. Just a reminder that you can now travel Derbyshire's Gentle Valley on Wednesdays from 27th July until 31st August (six weeks for the summer holidays). We will be operating our normal timetable which can be found here. An excellent Bus Gala with many happy visitors and a great deal of positive feedback from visitors from as far away as Cardiff, the Highland and Belper Bus Depot. A great many thanks to all concerned in this area. Work progressed on the BSK and other general maintenance. A mainly sunny day which saw a great many people take part in day one of the Classic Bus and Rail Gala. 8 heritage buses, some doing passenger rides, were complimented by Trent Bartons 685 which is named "Ecclesbourne Valley Railway". A good day was had by all and 20 classic buses are expected tomorrow. The track patrol that dealt with most of the line on Monday completed the task today with a walk from Gorsey Bank to Ravenstor. A good job well done! The dmu team gave a thorough service of the three car set ready form this weekend and remedied a number of faults that resulted from some four months of intensive service. Mott MacDonald have removed two of the three diverters fitted to the Duffield line on the Hannages leaving just the one for further passes through the season. The stench pipe, we do see life, fitted to the toilet block at Wirksworth has been extended somewhat so as to avoid contaminating the nostrils of our visitors and a final reorganisation of our main car park has released the space needed for tasteful display of classic buses to be welcomed this weekend. The Head of Gardening continued to maintain our station gardens at Wirksworth and No3 was prepared for the activity necessary over the next two days. Special praise for Hylton who gathered up the coal that had fallen from the Dust Dock during the Class 2 coaling exercises. The Booking Hall continued to deal with a welter of enquiries. I am back from the watery world of Venice to witness our usual level of high productivity. The VCT tended to repairs of their well used trailer and commenced preparation work for the extension of the palisade fencing at Gorsey Bank requested by a local councillor. The painting member of the team commenced work to enhance the visual warnings either side of the former Dust Dock where we are forever fearful of an accident due to the close proximity of the wall. The PWT comprising a very small team of three commendably replaced one rail under "Derby Road 1" bridge completing the changing of the badly corroded rails previously located there. They also tended to fishplate bolt tightening on rails previously replaced under the bridges towards Idridgehay. Both Mr and Mrs Craft were involved in a great deal of strimming around Wirksworth station making a considerable impact on the station approach and entrance to the childrens play area. Flailing took place north of Hazelwood as the battle with some 18 miles of lineside vegetation continues. A well meaning start was made on starting a narrow gauge siding but I most gently suggested that the very important maintenance of our "main line" was a greater priority as I cannot overemphasize the need to support the PWT in its work to finally resolve the track problems between Idridgehay and Shottle. The LMSCA demonstrated their first table and fixings for the Third Open achieving their usual standard of excellence and their was a promise that the Mark 1 BSK under restoration would be entering service at Easter 2012! The Booking Hall had a most productive day as the key earning period approaches. PS It is with tremendous regret that I have to report the death of John Evans last Sunday. John had been battling with cancer for some while and was always lauded as our oldest working volunteer, I now will have to seek another nominee. Anyone knowing John, who supported our activities at Idridgehay as "John the Paint", can confirm he was one of life's gentlemen and always a delight to meet. His daughter, Helen, wrote that "John found great pleasure and satisfaction in seeing the Railway progress so well and enjoyed hearing the trains from the open window of his home in Idridgehay". John's funeral is at Markeaton Crematorium next Wednesday at 1100 and Helen has asked for donations to the EVR or the RNLI in lieu of flowers. No mean feat as 240 ft of flatbottom rail weighs close on 4 tons so much care and effort is required to avoid injury. All done by hand as there is no room to use the Komatsu on this single line embankment. We have another 6 lengths or so to do to rid us of the side cut rail issue. VCT in evidence en-masse with the usual scorched earth policy in the vicinity of willow crossing. Steam team in attendance with No3 prepared for the weekend and further work on Henry Ellison. enquiries. The car park was tidied in readiness for next week's Bus Gala. general area of the floor. people concentrated on varnishing things nearer the floor. A mostly wet day with heavy rain, although the sun did come out later on. Despite the weather the passenger numbers were still solid and closely resembled the figures of last weekend. A little light DMU maintenance was undertaken, the 31 was fettled, the LMSCA were in attendance and so were just two of the 8F group. A small group of budding new volunteers were also inducted this afternoon. A warm and extremely pleasant day at Wirksworth International with much patient industry taking place along the vast estate. The Permanent Way team busied themselves with the development and installation of an ingenious side-stepping fishplate that, by all accounts, has revolutionised the process of transposing the rails in the (no longer) continuously-welded section. Superintendent Walker supervised the passing of a new DMU driver and we welcome Steve Parish to the Brotherhood of Gresham and Craven. Meanwhile, in the yard, a recently resuscitated L.J. Breeze partook of a little light shunting while the DMU team formed a most unusual formation for this weekend’s service: a MetCam / Derby Lightweight hybrid anyone? Elsewhere, Mr. Shone was seen to be applying paint to anything not moving (Paul Rayner now has a very attractive sheen), while the buffet car was prepared for the hordes of hungry visitors who will arrive over the weekend. Finally, the Duty Manager’s seat was occupied by the Tweedle Dum/ Tweedle Dee pairing of Messers Hall and Ferguson-Lee. Be very afraid. Early morning sunshine saw the PWT heading down the line for further corroded rail changing at Derby Road Bridge No. 2 (DJW11). Motive power was again provided by Faraday. A successful day's work resulted in 2 Down rails and 1 Up rail being changed. VCT made an early start to the MP137 area where, with Komatsu flail support, willow and blackthorn was cleared to give a 2-fire day and further improvement of views from and of the railway. 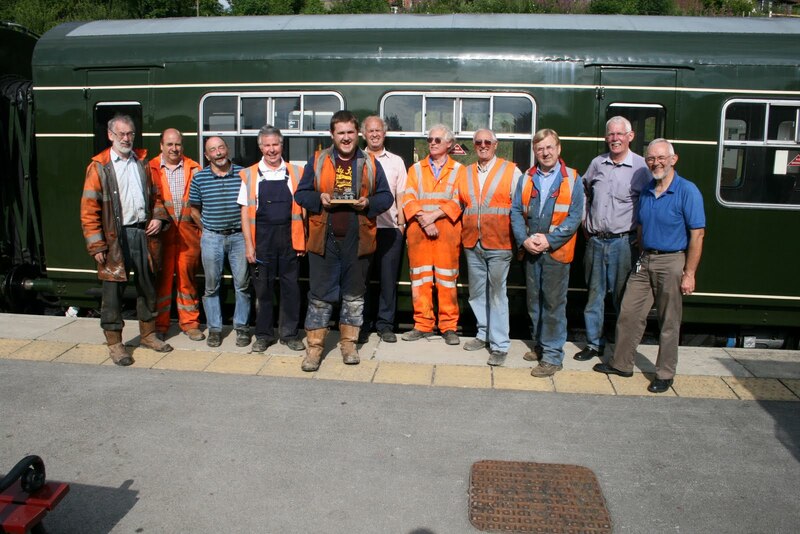 The combined talents of the diesel loco specialists led by Graham congregated to "sort out" LJB. After a thorough tracing process air was found to be getting into the fuel line. The immediate cause was remedied ( a new gasket will be a follow-up task) and LJB was soon shunting the yard in preparation for this evening's charter, which sees Ferrybridge No. 3 taking a party from Middleton Ladies' Guild for a champagne & canapés special in the saloon. Uplifted by their success the team then turned their attention to a remedial task on one of the Bubble Car's handrails. Dawn had a further attack on the GM office's non-filing system with more promised for next week; when the occupant returns there is a severe risk of disorientation! The day saw a steady stream of telephone enquiries and visitors to the Booking Office, whilst more paint was applied to the BSK. A cool but mercifully dry summer's day saw the PWT making stately progess to the long welded section in a cloud of blue exhaust haze as Faraday once more proved that an old 'un can still be a good 'un. In an update to yesterday's report I am reliably informed that it was Faraday's second excursion to the long welded (soon to be un-welded)site as sufficient air had been located yesterday to get it started and LJB remains in its state of torpor. On return the team reported a successful day with rail changing at Old Lane Bridge completed and a further 120 feet of side-cut rail transposed. Meanwhile in Wirksworth the Lone Cleaner was busy preparing the DMU set for the weekend's activities and a pair of conscripts learned the finer arts of ensuring that our customers can admire the view of our gentle valley through crystal-clear windows. In the station garden there was panic amongst the audacious bind weed that thought it could set up home here as Lynette put her Gardener's World skills into practice. In the Booking Hall new stock arrived for the shop and a steady stream of visitors continued through the day as did our phone lines with frequent enquiries about our services. Fresh share applications were collected by the share processing department. Down in the yard the steady work continued on restoring the BSK to service condition, with much fresh paint in evidence, black being the colour of the day. Quite a frustrating start to the major works programme on the long welded section that kept a lot of people standing about whilst problems were resolved where neither of our two locos would start. LJB had a flat battery and someone had fiddled with Faraday over the weekend resulting in the discharge of its air supply. However, LJB was eventually started and the PWT went to site and had further frustrations with the failure of the rail disc cutter and substitution by our ancient rail saw and very rusted pandrol clips. Eventually a 60ft section was cut out and replaced with further remedial work to continue through the week. The Komatsu went south to assist the VCT resulting in the end product of two overhanging trees being removed in the area of "willow crossing", a magnificent three fires and clearance of blackthorn opening up more views. The DST continued their quest with Henry Ellison attending to its safety valves, washout plugs, brake gear and painting together with a routine servicing of No3. LMSCA reported a secure fixing for their vice resulting in the inevitable enquiry as to whether it is their only vice. The Booking Hall had a most successful day accommodating further group and charter enquiries together with further planning of our Santa offers. 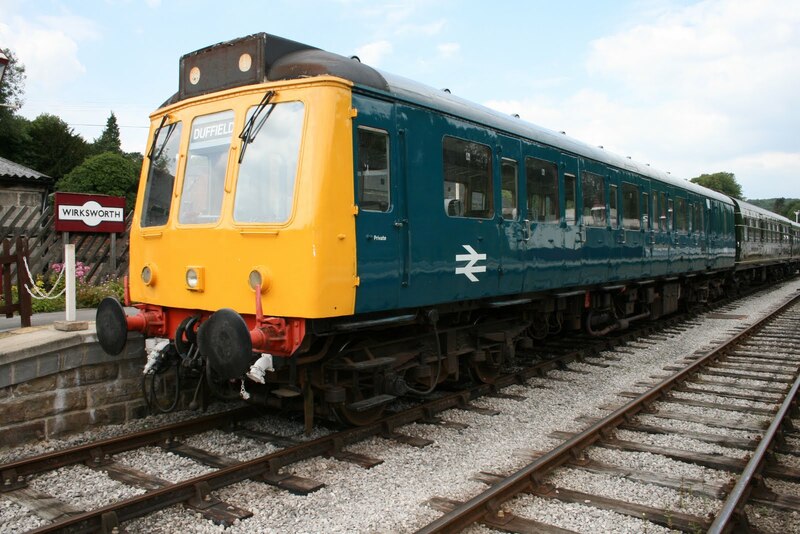 John Allsop varnished the west side of the Class 117 dmu and it looks a real treat as you may see from the attached photo. well being of the towns they serve. during the afternoon before the Great British Weather damped their ardour. A warm and sunny day which saw a repeat of good numbers on the passenger trains. We entertained a Golden Wedding Anniversary party who had a ride to Duffield and Ravenstor alongside a full buffet spread laid on by the catering department. We also played host to a small group visiting from Bewdley on the Severn Valley Railway, who were complementary about the enterprise. Down the yard, a lone LMSCA member continued working towards their aims and the LMS brake van started to receive a new floor. After giving the SVR lads a grand tour, a small (but perfectly formed it says here) DMU team continued with some painting inside 51505. A repair was undertaken on the bubble car guards door. A leisurely sort of day which saw a small amount of volunteers on site working towards the goals, when there wasn't a monsoon happening. Attention was once again turned to LJ Breeze, which is back in traffic having had a thorough exam. Out of the rain, two members of the DMU team continued painting inside 51505. The areas around the doors and immediately above the luggage racks, around the toilet and the corridor door saw a coat of green paint in an attempt to remove as much of the horrible 1980s orange and brown as possible. This work is being done as part of a mini-refurbishment which will include a new ceiling and a return to the original tungsten lighting. The booking hall hosted one or two damp visitors inbetween polishing off the retail refresh. The new products look quite good now they're displayed well. A very depleted PWT of just two frustrated the planned rail changing work but they gallantly continued the fishplate greasing required on the Incline and achieved five pairs. This does not bode very well for the commencement of remedial work on the long welded section next week! There was some mitigation of this poor turnout as a further two of the team went on tour to source more components for next week's planned work involving a visit to Doncaster and Worksop. A slightly largely team tended to the VCT activities with the stile and fencing repaires at Footpath 10 and two big fires reported in the area of milepost 137 including further reduction of the derelict platelayers hut in that area. Railcar W51360 received attention to prepare it for varnishing and the LMSCA refurbished their workshop bench to receive a vice. 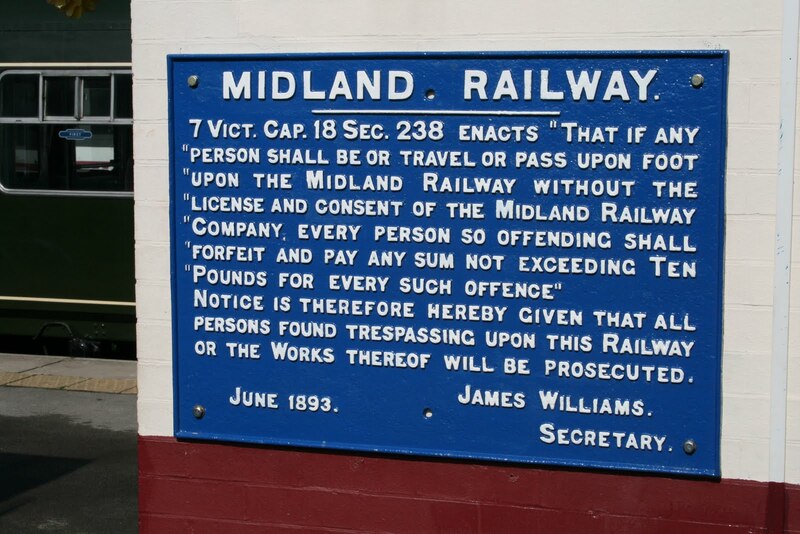 We welcomed a very short notice customer for an hour's testing this afternoon and a delightfully restored Midland Railway warning to trespassers was firmly fixed to the Office wall with many thanks to John Gratton for the work. The Booking Hall continued the quest to increase revenue. The relentless demands of maintenance on our extended railway saw the completion of the rail replacement at Jebbs Lane bridge and the replacement of one corroded rail underneath Callow Park bridge. This is a tedious but very essential part of keeping the Railway safe and will be ongoing until the offending areas are dealt with. Faraday was again pressed into service with the supporting Works Train and whilst somewhat slow has proved to be a reliable servant so far. With the line blocked at Jebbs Lane the flail set sail for a few more cuts on the Incline and the end result should be appreciated by our passengers. The lone carriage cleaner gave the three car dmu set a good do and dealt with the Gatwick Express stock as well.She also educated me in how to use "Word" and convert documents to "PDF" files which does prove you are never to old to learn! The Booking Hall was also in revenue generation mode with more group booking enquiries and our till system in the Booking Hall and Gatwick Express has been upgraded which, I think, is good news. The event information for the 2011 Classic Bus and Rail Gala is now on our website at www.e-v-r.com/eventinfo . Last years event was one of busiest to date at the time so lets see what this year can bring! A day of great variety with the PWT setting off with Faraday as the train engine that I thought would never work another trip with us having been sidelined into the Museum exhibition. However, he is risen again because of the failure of L J Breeze which will require some time to remedy and the demands that track work must continue. Faraday and train went to Jebbs Lane to replace another two corroded rails under the bridge and whilst progress was made that site will have to be revisited tomorrow. The VCT had a mixed day commencing with the removal of overhanging branches just south of Ken Rowland's crossing and then tending to the sight lines of all footpath crossing to the south. In the area of "willow crossing", just north of Shottle, a huge fire dealt with accumulated brash and made a strong attack on a derelict timber platelayers hut that has presented an eyesore for some time. Painting of mileposts 141 and 139 3/4 was also achieved together with the storage of timber recovered from our opening display at the roadside from the top of Ken's drive. The DST were in action tending to Henry Ellison and the LMSCA combined with the restorer of the Mark 1 BSK to move that project forward. LJB enjoyed an oil change and now waits replacement filters in an effort to return the locomotive to reliable action. The Booking Hall tidied up the accounts from the weekend and raised a little revenue from the visitors that arrived on site today. Tony Watt accomplished a whole line track patrol yesterday allowing for further work on the line tomorrow without the need for further patrolling. 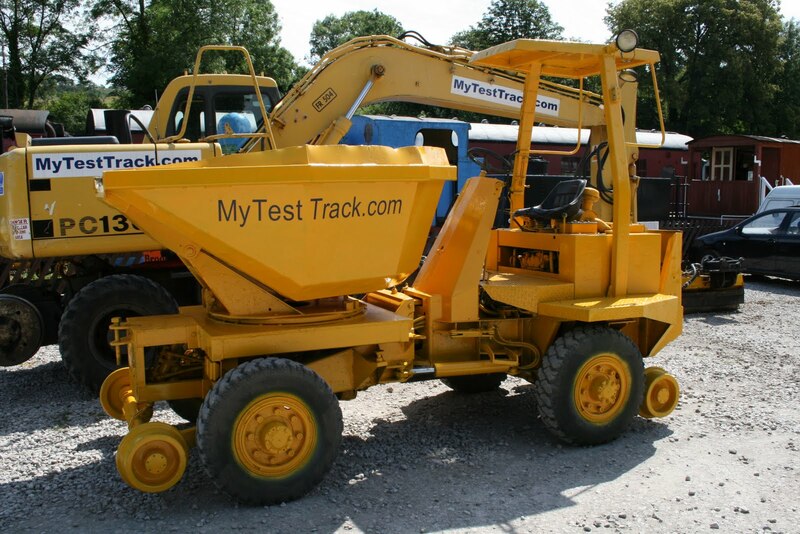 The road/rail dumper, which was the first donated vehicle we received some ten years ago, has had a makeover as a reward for the years of service without too much care and attention and I attach a photo of the vehicle in ex works condition. The varnishing of the Saloon is now complete and further work has been undertaken to smarten up the bogies of the Class 31. Many visitors took advantage of the warmth and had a look round yielding modest gains for the Booking Hall. Matt kindly showed a visitor from the Wensleydale Railway around the Station and Yard. Lawn mowing was planned for Duffield in the cool of the evening. A fine, warm and sunny day saw many visitors browse the classic vehicles on show. After dispatching a lost dog back to their owner, everything bumbled along happily! The Day with a Driver enjoyed himself. Down the yard, a lone member working on the lighting wiring in 51505 and Class 31 maintenance took place. The 8F group were in attendance. Well we are half way through the year and there is a lot to do in the next six months! Today saw the Saloon varnished on the east side and north end with the remainder to be dealt with next week. We entertained four Drive a Diesel clients very ably hosted by Lewis and Richard who continued with our new formula of L J Breeze in the morning and a dmu in the afternoon. As ever, the clients departed fulsome in their praise for a great day. The Head of Gardening was active at Wirksworth and No3 was warmed through for tomorrow's activity. The first of the exhibits for the Classic Transport Weekend is expected this evening in the form of a vintage fire engine. The organiser was present and the range of participants does seem extremely interesting boding well for a successful event. In amongst the activity there was an opportunity for further dmu driver training and a look at L J Breeze this afternoon to deal with some maintenance issues. Ceiling painting of one of the dmu fleet also took place.